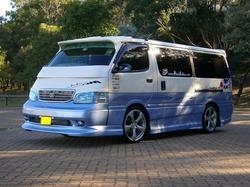 Hi I have an M reg hiace super custom and the roller on the sliding door has broken, the wheels which sit against the frame of the van have broken off and now it's metal of metal, I'm wondering if anyone knows how o go about replacing them? Check here for the design and parts. If you can't get the parts perhaps a roller bearing or similar wheel may do as a substitute - many vans have the same basic action so I can't imagine it's that unique. Hi, I had a look at my door catch there when the door was 'just' open (so the rollers were on the corner). To me it looks like there are 3 simple (but stainless!) 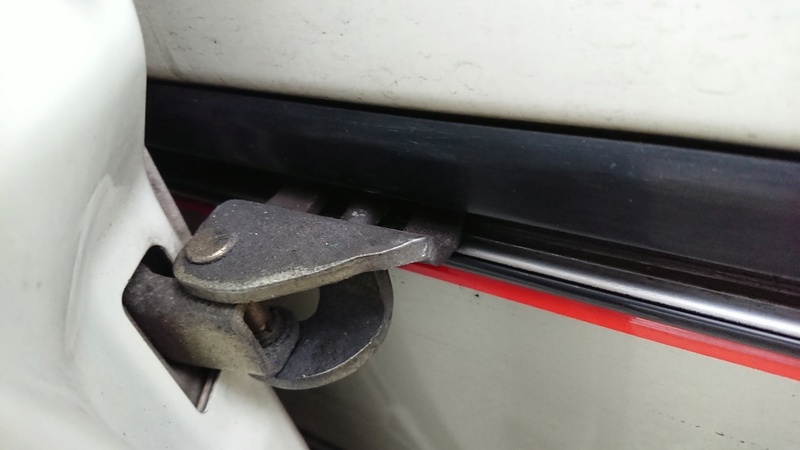 roller bearings - two small ones either side to stop the door moving horizontally and one bigger one in the middle to take the weight of the door as it rolls along the track. 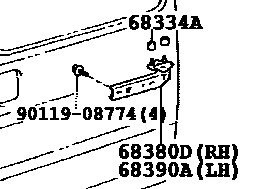 The assembly is held into the door with a bolt just under the trim that locks it in (see diagram). and the track end has a screw in it - so to remove the assembly you support the door, undo the bolt and roll the assembly to the end of the track to remove it. Without letting the door fall out. Mine has the rear roller missing but still the pin so I'll need to get mine out too so I can fix it, it looks like it should be fairly easy to fix with the right sized bearings without buying a new assembly, the key is to get it out and have a closer look. Bearings can be had online at various sizes, they may be ok just slipped onto the pins or may be better with bolts and nyloc nuts to hold them - I've yet to decide. from the site I linked to. Some thread resurrection here as I took out my slider to address the missing roller today. 1. The middle panel interior trim is easily removed with some red nylon trim levers. Don't use screwdrivers, trim levers are available from eBay etc for peanuts, don't scratch and will quickly become your best friend. Poppers are along the bottom of the panel and up each side, none on the top as that slots under another bit of trim. 2. Now you'll need to open the passenger door, have a table handy, fold and slide the passenger seat forward so you have an alternate route in and out of the van. 3. Then securely prop up the base of the back of the sliding door (when about 2" open) as it will fall down when open without the slider in place and damage stuff. 4. Now you can use a 12mm socket to undo the two bolts (under the condensation tape!) that hold the slider on. Probably best to have someone outside looking after the door. 5. Then undo the rear trim bit at the end of the slide and gently slide out the slider assembly. 6. Make a note of the dirt circles the bolts made as it gives a clue to the correct position come re-assembly in the door. Mine has the main wheel which was in good condition, one side roller and one missing side roller. Luckily I had an old aluminium spacer of the right diameters but 20mm tall so I cut that down, stuck it in a drill as a rudimentary lathe to smooth the cut end and used that with some new Moly-grease on both rollers. You shouldn't really mix aluminium and steel but it was convenient and I can always upgrade in a future year, the ideal material is stainless steel but get it of the right size as it's very difficult to work. Then just re-assemble, as a top tip, check the fit over the door pin carefully when adjusting the slider you unbolted, and check the vertical gap at the bottom on the door is the same as the top of the door to check you got it straight, and be gentle while you confirm the fit again. Hope this helps - pretty simple and easy if you can get the rollers first so you can pop them right in. 3mm x 3 = 9mm height with 3 bearing races per roller pin.